There no doubt that L.A. Noire was a particularly unique game when it came out in 2011 for the current console generation. It is the kind of game that definitely makes the video game industry look good compared to other forms of entertainment such as movies. Video game fanatics have always pointed out the artistic part of certain titles in response to the critics saying that video games are childish and violent pastimes with no positive influence on society. When it comes to these debates, I'm sure that L.A. Noire is now brought up frequently in these discussions and that its depth as a piece of art is used as a strong argument. What was so artistic about about L.A. Noire? Well, it's a game that is firstly based on its movie-like storyline and dialogues. But at the same time, it managed to include decent (and sometimes very strong) gameplay elements that made the ride throughout the storyline that much more enjoyable. So to sum things up, L.A. Noire stood its ground both as a video game and as a deeper artistic realization. So what's the next step after L.A. Noire? 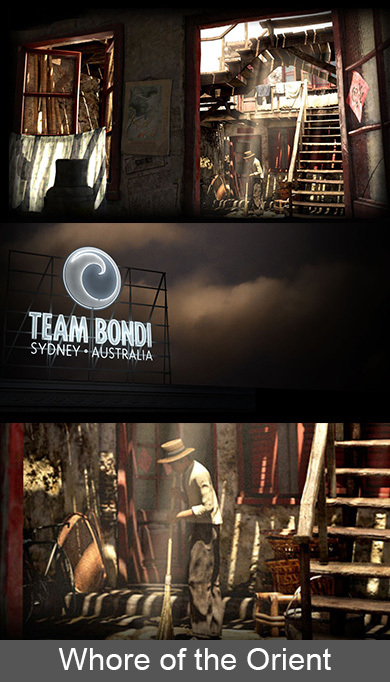 Well, developer Team Bondi is now working on a new game for next-generation consoles that we can expect to be just as enticing as the Los Angeles adventure of 2011. Its name is Whore of the Orient. This time, the story moves over to Shanghai during the 1930's, and once again, the player takes on the role of cops who will try to keep this crazy city in order. If the move from LA to Shanghai bothers you, Team Bondi's Brendan McNamara describes the new tale and location as "one of the great untold stories of the 20th Century. ", so a little open-mindness will allow you to experience a world that could be even more engaging than the streets of L.A.
Can Whore of the Orient live up to the success of L.A. Noire? Well, despite being a brand new game, it will incorporate most of the strong elements that made the first game so immersive, most importantly facial motion-scan technology. If you haven’t played any game that used that feature, you can witness its great effective in delivering believable characters in the video above. Will this technology be even more enjoyable and convincing with the brand new PS4 hardware? You bet! Let’s hope that Whore of the Orient can once again become the reference when it comes to “movie-like” video games and that the open city will be just as fun to explore as it was in L.A. Noire. As you can guess, games like L.A. Noire and Whore of the Orient aren’t created overnight, and this new title should only be expected in 2015. Full production has just kicked off and you know the team will need some time to make every dialogue, race, block and case captivating. Some people might complain about the fact that the game will take so long to be completed, but in a way gamers must make up their mind: be ready to wait for quality games to be created or deal with half-completed games that are rushed every year to make the Christmas deadline. It’s obvious that the Whore of the Orient developers are serious about making this more than a commercial hit and the time needed to record each dialogue and face animation also has to be taken in consideration. In the span of these few years, don’t forget to come back to this page to get your dose of updates for this promising title! Whore of the Orient Cancelled? The title is now reportedly in jeopardy after reports indicating that the team working on this original title had been laid off by Kennedy Mitchell Miller. A few sources also state troubles with publishers. In the meantime, other facts indicate otherwise and that the project could still be alive, as job posts concerning the game have been found as recently as April, and KMM partner Doug Mitchell saying that the company is still looking for the right investors for Whore of the Orient. The last time we heard about the title was in November of last year, when we learned that a 2015 date was targeted. This release period and the status of development are still up in the air so we will have to wait for further information to confirm anything. News have come out that KMM has been awarded $200 000 by the Australian government, which should help bring things forward. However, we are still in the dark when it comes to knowing when has been going on with the development of the game and its status. Still, this news should keep Whore of the Orient out of the grave for the moment. Stay tuned right here for some more official news. In the meantime, a video of the actual game has been circulating around the web, which can be viewed on various YouTube channels and be seen above. We can see our character exploring the city and a bit of combat and shooting as well. This arrival of this footage at this point is surprising, but it's still cool to know that the game apparently won't be departing too much from the LA Noire style of play. Obviously, we should point out that the game is still very early in development and that the 2015 date still stands, so there's a lot of time for it to improve. We should be talking in terms of "alpha" footage and nothing more. Still, fans can rejoice from these two tiny news bits right here. Whore of the Orient with a new name? Something pretty unexpected happened recently in Whore of the Orient's case. It's pretty much a known fact that the game doesn't have the prettiest of names, but it's now actually being taken to the Human Rights commission, and surprisingly, it's not even for the first word of its title. It's rather the word "Orient" that mainly bugs City of Monash councillor Jieh-Yung Lo who plans on filing the complain. It's said that the word brings painful racial issues for people within these communities. Of course, the word "Whore" isn't being especially appreciated either, so the game could be hitting more road bumps of a new nature in the near future. This will ultimately count as one of the game's many struggles leading to the game being finally produced and delivered to fans. So what do you guys are making of all this? Are you okay with your children seeing a game named "Whore of the Orient" on the shelves? Is it even acceptable that a game with this name has made it this far? And going further... is this game cursed in all possible ways? Or are the developers simply going to far to trying to gain attention? Personally, at least I'm now aware that the word "Orient" can be offensive to some parts of the world. Thanks Whore of the Orient.